Own the Sony PlayStation 4 Slim model and enjoy a gritty, life-like, and immersive gaming experience every time you power your gaming console on. Discover a dynamic gaming world with powerful graphics, striking clarity, and innovative technologies which come together and offer you an unmatched experience all around. Boasting a 500GB hard drive, the PS4 Slim model offers you plenty of space to store all of your data, be it games, applications, screenshots, or videos. The Sony PlayStation 4 Slim model comes with 2 wireless controllers which allow you to take full control of your experience and opens the doors of entertainment for you. While you are effortlessly controlling your PlayStation, the ergonomic and beautiful design will make you feel as if you are holding a gadget from the future. This feeling is completed with the PlayStation’s modern super-cool silver color! The Sony PlayStation 4 Slim doesn’t only look good, it also delivers a striking and captivating gaming experience with its HDR-enabled PS4 games, vivid colors, and life-like clarity. Whenever you start playing, you will be taken on a gaming journey and will feel as if you are right in the middle of the action. Thanks to the single-chip custom processor, you will be able to enjoy a smooth and seamless gaming experience, no matter what games you are playing. With a plethora of features, the Sony PlayStation 4 Slim will soon become your favorite free-time companion! While the Sony PlayStation 4 Slim is now thinner and sleeker than the ones before it, it still delivers the powerful performance you would expect from PlayStation. You can still store all of your games, applications, videos, and even take screenshots of your game and access them whenever and wherever you want. Prepare to be taken on beautiful journeys with every game you play. Thanks to the single-chip custom processor, you will enjoy a smooth experience all the time. Your games will come to life with captivating colors, life-like details, and striking clarity. Boasting innovative technologies, the PS4 Slim model is bound to take faster actions, making your experience smoother and more responsive than ever before. Enjoy the revamped look and feel of the DUALSHOCK 4 wireless controller. The ergonomic design and improved using experience make this PlayStation controller more intuitive than any of the previous controllers. Completed with a visible and colorful light bar, this controller will let you experience more of your games. Enter a world which is packed with fun. Whether you are playing a blockbuster game or one of PlayStation’s exclusive games, prepare to get immersed in an unparalleled gaming experience. Along with discovering games, you can now tackle your favorite movies, TV Shoes, and online video and music streaming applications right from your PS4 Home Screen. Whether you want to invite your friends to join your adventure, challenge them, or ask them to take over for you, the Share Play feature offers you the chance to share your gaming experience with your favorite gaming mates. While you can easily share your games, with the Remote Play feature you can take your games on the road without being limited to one TV. And because sharing is important, the PlayStation 4 Slim model allows you to share screenshots of your best moments on Twitter and Facebook and also allows you to broadcast your adventure live on Twitch, YouTube, and DailyMotion. Add your very own personal touch to your gaming world. The Sony PlayStation 4 Slim comes with a new and fresher interface which doesn’t only give you a cleaner interface, but also the options of personalizing your experience. Whether you want to change the wallpaper to one your glorious screenshots, make folders for your games, make you very own set of shortcuts, or customize your PSN profile, the PS4 Slim makes this possible. And now to make your life even easier, you can now download games, videos, and application on any USB storage device and access them whenever you need. Own the Sony PlayStation 4 Slim model and enjoy a gritty, life-like, and immersive gaming experience every time you power your gaming console on. Discover a dynamic gaming world with powerful graphics, striking clarity, and innovative technologies which come together and offer you an unmatched experience all around. Boasting a 500GB hard drive, the PS4 Slim model offers you plenty of space to store all of your data, be it games, applications, screenshots, or videos. The Sony PlayStation 4 Slim model comes with 2 wireless controllers which allow you to take full control of your experience and opens the doors of entertainment for you. While you are effortlessly controlling your PlayStation, the ergonomic and beautiful design will make you feel as if you are holding a gadget from the future. This feeling is completed with the PlayStation’s modern super-cool silver color! The Sony PlayStation 4 Slim doesn’t only look good, it also delivers a striking and captivating gaming experience with its HDR-enabled PS4 games, vivid colors, and life-like clarity. Whenever you start playing, you will be taken on a gaming journey and will feel as if you are right in the middle of the action. Thanks to the single-chip custom processor, you will be able to enjoy a smooth and seamless gaming experience, no matter what games you are playing. With a plethora of features, the Sony PlayStation 4 Slim will soon become your favorite free-time companion! 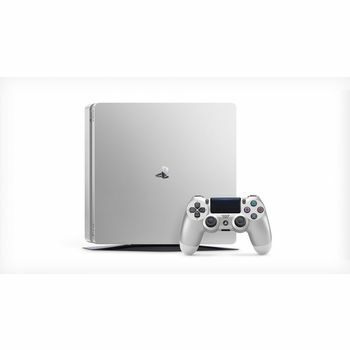 SLIM, YET POWERFUL While the Sony PlayStation 4 Slim is now thinner and sleeker than the ones before it, it still delivers the powerful performance you would expect from PlayStation. You can still store all of your games, applications, videos, and even take screenshots of your game and access them whenever and wherever you want. PACKED PERFORMANCE Prepare to be taken on beautiful journeys with every game you play. Thanks to the single-chip custom processor, you will enjoy a smooth experience all the time. Your games will come to life with captivating colors, life-like details, and striking clarity. Boasting innovative technologies, the PS4 Slim model is bound to take faster actions, making your experience smoother and more responsive than ever before. TAKE FULL CONTROL Enjoy the revamped look and feel of the DUALSHOCK 4 wireless controller. The ergonomic design and improved using experience make this PlayStation controller more intuitive than any of the previous controllers. Completed with a visible and colorful light bar, this controller will let you experience more of your games. A WORLD OF ENTERTAINMENT Enter a world which is packed with fun. Whether you are playing a blockbuster game or one of PlayStation’s exclusive games, prepare to get immersed in an unparalleled gaming experience. Along with discovering games, you can now tackle your favorite movies, TV Shoes, and online video and music streaming applications right from your PS4 Home Screen. PLAY BY YOUR RULES Whether you want to invite your friends to join your adventure, challenge them, or ask them to take over for you, the Share Play feature offers you the chance to share your gaming experience with your favorite gaming mates. While you can easily share your games, with the Remote Play feature you can take your games on the road without being limited to one TV. And because sharing is important, the PlayStation 4 Slim model allows you to share screenshots of your best moments on Twitter and Facebook and also allows you to broadcast your adventure live on Twitch, YouTube, and DailyMotion. PERSONALIZED EXPERIENCE Add your very own personal touch to your gaming world. The Sony PlayStation 4 Slim comes with a new and fresher interface which doesn’t only give you a cleaner interface, but also the options of personalizing your experience. Whether you want to change the wallpaper to one your glorious screenshots, make folders for your games, make you very own set of shortcuts, or customize your PSN profile, the PS4 Slim makes this possible. And now to make your life even easier, you can now download games, videos, and application on any USB storage device and access them whenever you need.